Angaangaq Angakkorsuaq, shaman, healer, storyteller and carrier of the Qilaut (winddrum), is an Eskimo-Kalaallit Elder whose family belongs to the traditional healers of the Far North from Kalaallit Nunaat, Greenland. 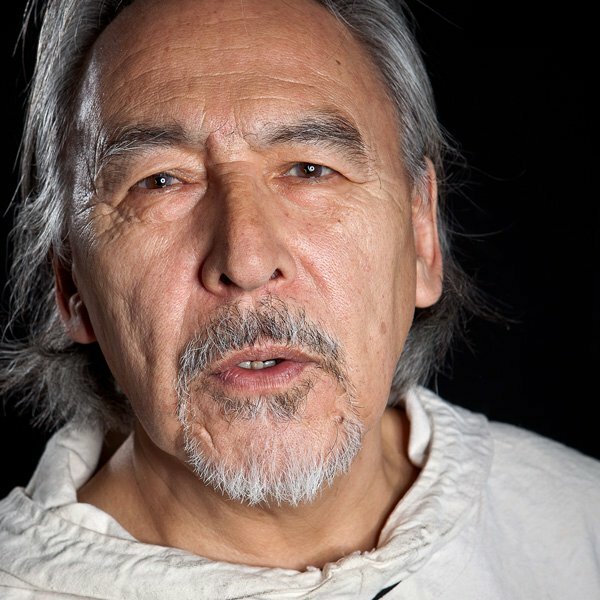 Angaangaq, who’s name means ‘The Man Who Looks Like His Uncle’ is an internationally respected Elder for the native communities of the Circumpolar Arctic, North and South America, and Europe. Uncle, as he is frequently called, bridges the boundaries of cultures and faiths in people young and old. His work has taken him to five continents and over 50 countries around the world including South Africa, North America, South America, Asia, Arctic Europe, Russia, and Siberia. Angaangaq conducts healing circles, intensives, and sweat lodges. His teachings are deeply rooted in the wisdom of the oral healing traditions of his people. This entry was posted in Make No Bones Shows and tagged Angaangaq Angakkorsuaq, Honoring, Ice Wisdom, Indigenous, Journey to the Heart, KAOS 89.3 FM, Make No Bones About It, Raven Redbone, Thanks. Bookmark the permalink. What a wise man, he is bringing everybody togeather, and opening their Hearts to the Oneness that we all are no matter where we come from. I am really looking forward to next weeks show Raven, good show tonight.